M’UAD DIB, a one page comic by Paul Pope based on a sentence from Dune. This entry was posted in Comics on October 25, 2009 by Dotan Dimet. This entry was posted in Blather on October 08, 2009 by Dotan Dimet. Bill Willingham, creator of Fables, is this year’s ICon guest of honor and, sadly, his works to which I have the strongest emotional connection are his early stuff, such as the superhero series Elementals, as well as some pretty embarrassing stuff. Nevermind Ironwood, consider his journeyman work as an artist for TSR, where he produced illustrations during what was the most important period in the history of Dungeons and Dragons: the time I was actually buying and playing that game. Of course, this was so long ago that only a handful of old guys like me probably remember that. Kids today, they think AD&D started with second edition, and they only know the Basic and Expert sets with Larry Elmore covers; not that I have anything against Elmore, Snarfquest rules and all, but I prefer fantasy art that isn’t inspired by aerobics instructors’ posteriors, but rather by, say, Marvel Comics. 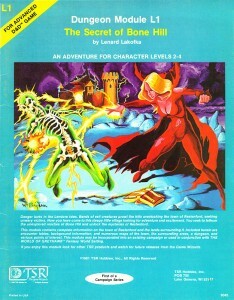 Like this, the cover of the AD&D module L1: The Secret of Bone Hill, which I was describing with some excitement to someone on the first night of ICon (prompting Bo to comment: “I forgot how funny you are when you’re drunk”). That blonde Magic User chick laying the righteous lightning bolt on the skeleton has obviously been raiding the Scarlet Witch‘s wardrobe (for, specifically, this). 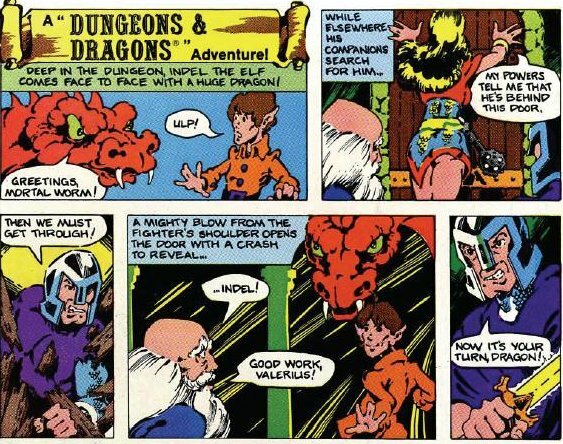 Probably the niftiest (for a peculiar definition of nifty, I admit) of Willingham’s TSR portfolio was the comic that ran as part of a series of TSR adverts for Dungeons and Dragons inside regular Marvel and DC comics, which someone has collected nicely – all but the first one of which were drawn by Willingham, and which include a couple of additional winks to comics, like the fighter’s very Magneto-ish helmet. This is historical stuff, one of the few times the producers of a roleplaying game reach out and try to interest a mainstream (well, comics-reading) audience in the roleplaying hobby. It is also, at times, hilariously bad, as pointed out at length in this panel–by–panel analysis [links via this blog]. This entry was posted in Comics, Roleplaying and tagged Bill Willingham, Dungeons and Dragons on October 08, 2009 by Dotan Dimet. A flurry of recommendation emails from Amazon drove me to visit their site to unsubscribe from their promotional emails. This entry was posted in Blather on October 05, 2009 by Dotan Dimet.